QUESTION: Can you take bitter melon and cinnamon tablets together? If yes, how much? If you are talking about taking separate tablets of bitter melon and other for cinnamon, as long as I know, one can take them. However, you should see the manufacturer's instruction pamphlet for the dosage. It depends on the brand you are taking. As long as cinnamon and bitter melon can be also added together while you prepare your meals; I do not see any reason why they shouldn't be taken together. Unless, you have any allergy reaction from any of them, and you "should not take" altogether. 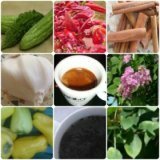 I have run through certain supplements that do have cinnamon (Ceylon) and bitter melon extract together with the extract of other herbs, all in one, without causing any harm. At the end, although supplements can help you lower your blood sugar level at this particular moment; however, you should not rely only on their work. You should try to organize your diabetic meals and keep active accordingly to get the best natural results that will last forever. Unless, you will "destroy" them with your lifestyle. Remember: Water is your best friend and helper. Drink as much as you can (especially natural mineral or oxygenated one) during the day, to help your body get rid of wastes, and work properly and to control diabetes too.